Update: And it’s official. Ubisoft have tweeted a short teaser with a fella doing that kick from the meme. As E3 approaches, rumours and teasers are flying off all over. Here’s a new rumour for you: Ubisoft are following up on the Egyptian Assassin’s Creed Origins with a visit to ancient Greece in a game named Assassin’s Creed Odyssey. 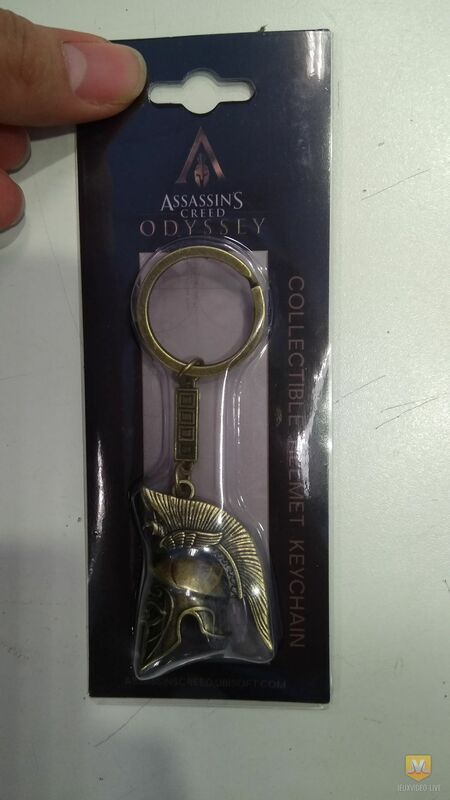 That’s the buzz from French site JeuxVideo-Live, who have a photo they say is a keyring promoting the game from a source they trust. The supposed promo tat is in the shape of a Spartan helmet, like that movie with the radge from Paisley in the leather pants, so: rumour is, the stabmen are off to Greece. Ubisoft, of course, have announced no such game.JVL say their insider told ’em Assassin’s Creed Odyssey will come in 2019. Beyond that, the name, and the hat, that’s all they have to say. And obviously this is all unconfirmed rumour. Is this real? Could be. Origins wrapped up its expansions in March and Ubisoft, though they have kept tinkering with the game since then, are surely already working on the next game. But is this specifically the next game? Dunno. It wouldn’t be too difficult to fake promo tat like that, mind. I did have a quick look around sites which sell this sort of trinket and didn’t see any matches, though my search wasn’t exhaustive. In conclusion, hey, look, E3 is coming, and rumours and leaks are flying all over to preempt and fake announcements. One way or another, we’ll probably discover the truth about this then. Ubisoft’s E3 press conference is on Monday the 11th of June at 9pm (1pm Pacific), and will be livestreamed for all to see. If they have something to announce, it’ll be then. What would you be hoping for in a new AssCreed, gang? Our Assassin’s Creed Origins review was v. pleased with the return of Ubisoft’s open-world murder simulator after a little convalescence.